This week my irreplaceable assistant Tabatha has prepared a list of books especially for those of you with a long drive for the holidays. When he’s hired to pilfer a portfolio of valuable documents from a Park Avenue apartment, Bernie can hardly refuse. But the occupant’s early return forces Bernie to flee empty-handed–and he soon finds himself implicated in a murder. Before you can say “who stole the strawberries?” he’s hunting for a killer, up to his neck in the outrageous intrigues of a tiny Balkan nation . . . and menaced by more sinister fat men and unsavory toadies than the great Bogie himself butted heads with in pursuit of that darn bird. Stay Out Of My Nightmare Kip Morgan goes looking for an old war buddy and comes up against a corrupt veteran’s club. A murderous women, and his own imprisonment in a watery tomb. Street Of Lost Corpses Private investigator Kip Morgan foes undercover in this gripping story of men disappearing on a shabby street in a lonely warehouse district. Actress Marilyn Marcy has hired Morgan to find her brother, and Louis L’Amour’s trail leads us to the Street of lost Corpses. If you want to revisit an old favorite, or brush up on Middle-Earth before the movie comes out, you can always find The Hobbit or There and Back Again by J.R.R. Tolkien. In J.R.R. Tolkien’s classic prelude to his Lord of the Rings trilogy Bilbo Baggins is a hobbit who enjoys a comfortable, unambitious life, rarely traveling any farther than his pantry or cellar. But his contentment is disturbed when the wizard Gandalf and a company of dwarves arrive on his doorstep one day to whisk him away on an adventure. They have launched a plot to raid the treasure hoard guarded by Smaug the Magnificent, a large and very dangerous dragon. 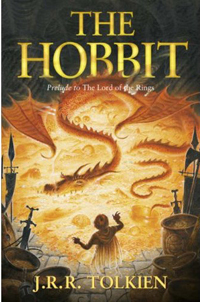 Bilbo reluctantly joins their quest, unaware that on his journey to the Lonely Mountain he will encounter both a magic ring and a frightening creature known as Gollum. While I cannot vouch for this one just yet, I have high hopes as Stick by Elmore Leonard will be accompanying me on my own trek home. After serving time for armed robbery, Ernest “Stick” Stickley is back on the outside and trying to stay legit. But it’s tough staying straight in a crooked town — and Miami is a pirate’s paradise, where investment fat cats and lowlife drug dealers hold hands and dance. And when a crazed player chooses Stick at random to die for another man’s sins, the struggling ex-con is left with no choice but to dive right back into the game. Besides, Stick knows a good thing when he sees it — and a golden opportunity to run a very profitable sweet revenge scam seems much too tasty to pass up. For anyone who is annoyed at the way Christmas jumps over Halloween and Thanksgiving these days, why not move backwards for once and listen to some good old fashioned scary stories this Thanksgiving? And why not do it with this lovely collection which includes “1408” a story which, I promise, is even more spine-chilling in audio. The first collection of stories Stephen King has published since Nightmares & Dreamscapes nine years ago, Everything’s Eventual includes one O. Henry Prize winner, two other award winners, four stories published by The New Yorker, and “Riding the Bullet,” King’s original e-book, which attracted over half a million online readers and became the most famous short story of the decade. “Riding the Bullet,” published here on paper for the first time, is the story of Alan Parker, who’s hitchhiking to see his dying mother but takes the wrong ride, farther than he ever intended. In “Lunch at the Gotham Cafe,” a sparring couple’s contentious lunch turns very, very bloody when the maitre d’ gets out of sorts. “1408,” the audio story in print for the first time, is about a successful writer whose specialty is “Ten Nights in Ten Haunted Graveyards” or “Ten Nights in Ten Haunted Houses,” and though Room 1408 at the Dolphin Hotel doesn’t kill him, he won’t be writing about ghosts anymore. And in “That Feeling, You Can Only Say What It Is in French,” terror is deja vu at 16,000 feet. 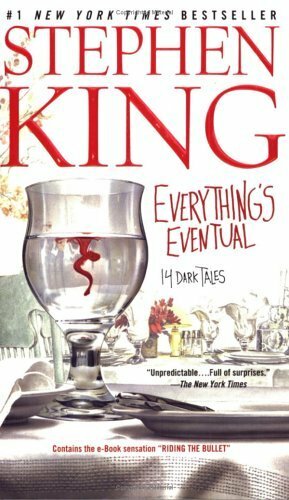 Whether writing about encounters with the dead, the near dead, or about the mundane dreads of life, from quitting smoking to yard sales, Stephen King is at the top of his form in the fourteen dark tales assembled in Everything’s Eventual. Intense, eerie, and instantly compelling, they announce the stunningly fertile imagination of perhaps the greatest storyteller of our time. And finally, since I shouldn’t be a grouch, and we are now officially past Thanksgiving, one last book to get you into the (coming) holiday season! One of the best-loved and most quoted stories of “the man who invented Christmas”-English writer Charles Dickens-A Christmas Carol debuted in 1843 and has touched millions of hearts since. Cruel miser Ebeneezer Scrooge has never met a shilling he doesn’t like. . .and hardly a man he does. And he hates Christmas most of all. When Scrooge is visited by his old partner, Jacob Marley, and the ghosts of Christmas Past, Christmas Present, and Christmas Yet to Come, he learns eternal lessons of charity, kindness, and goodwill. Experience a true Victorian Christmas! Previous PostPrevious Fiction Reboot Sneak Peak: Automatic Woman by Nathan Yocum! Next PostNext Friday Fiction Feature: Wishing you a creepy Christmas!